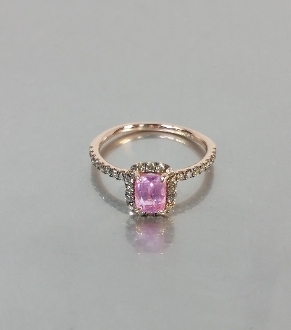 This pink sapphire ring is set in solid 14 karat rose gold with a champagne diamond halo. Pink sapphire total weight is 0.85ct and measures 4x6mm. Champagne diamond total weight is 0.33ct. Champagne diamond halo measures 7x8mm.